"Painting from life gives life to my paintings. 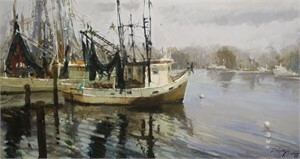 I paint outdoors, in the greatest studio any artist could ever hope for. I try to capture the essence of my subjects, whether painting people, places, or things. I use paint, brush, and knife to express the moment, the place, and the subject, looking for abstract shapes, contrast in values, soft or vibrant colors, and light to bring the viewer to the places I've been, see what I've seen, and experience the feelings I felt." 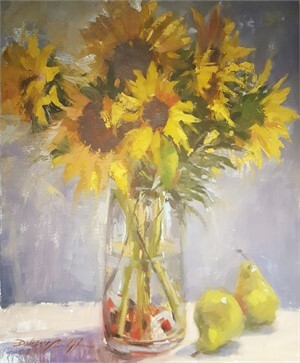 - Katie Dobson Cundiff Recognized for her bold and confident brushwork, Katie Dobson Cundiff paints almost exclusively en plein air or from life. 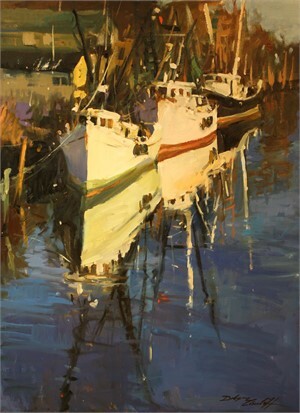 Born in Chicago in1950 to artist parents, Katie showed signs of artistic abilities at an early age, and was awarded a National Scholastic Scholarship in 1968 to attend the Ringling College of Art and Design. Upon graduating and marrying in 1971, she and her husband owned a decorative accessory design business selling to high end retailers including Marshall Fields, Neiman Marcus, Speigels, Macy's, and Bloomingdales. In 1981 their business grew to include their own chain of retail art galleries featuring their exclusive designs. Eventually, the galleries paved the way for a new business venture in wildlife art apparel printing, with clients including Ducks Unlimited, Safari Clubs International, Wildlife Federation of Florida, Quail Unlimited, National Wild Turkey Federation, and Gulf Coast Conservation Association. Through the sale of Katie's designs, hundreds of thousands of dollars were contributed to these organizations. 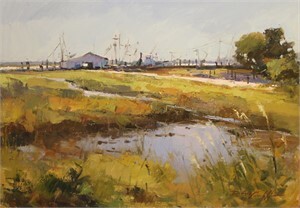 In 2000, Katie focused on painting the landscape en plein air, entering her first plein air competition in 2004, and in 2009 returned to painting and teaching full time. 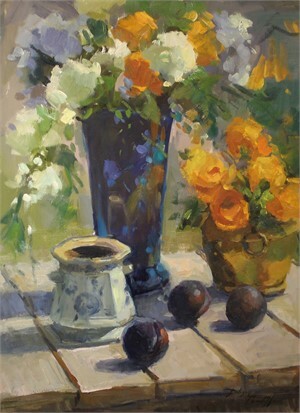 Katie is a member of, and has exhibited with many respected organizations and received awards in National Exhibitions including the The Oil Painters of America, The American Impressionists Society, American Women Artists, Women Painteres of the Southeast, Cumberland Society of Painters, and Plein Air Painters of the Southeast.